Don’t adjust your computer settings. You are INDEED seeing 2 blog posts in the same month. It’s an October Miracle. I just got these wonderful ornament framelits. (Delicate Ornaments) actually comes as a bundle with the stamps… called Embellished Ornaments bundle. (I didn’t actually use the stamps here, but they are nice). These pictures don’t do this justice. But, I cut the ornaments out of the dazzling diamonds glimmer paper. And OH MY. I hadn’t bought that paper till now, but it is GORGEOUS. Makes me want to buy enough to wallpaper my house. It’s beautifully sparkly, but subtle, as to not overdo everything. This first pic (above) I decorated one of our Kraft Tag a Bag Gift Bags . (They’re awesome cause they are only $3.50 for 10.) I love that they are plain…. they are just WAITING for something cute to go on them! I used a bit of the Tip Top Taupe lace trim and silver sequin trim to complete the top of the ornament. 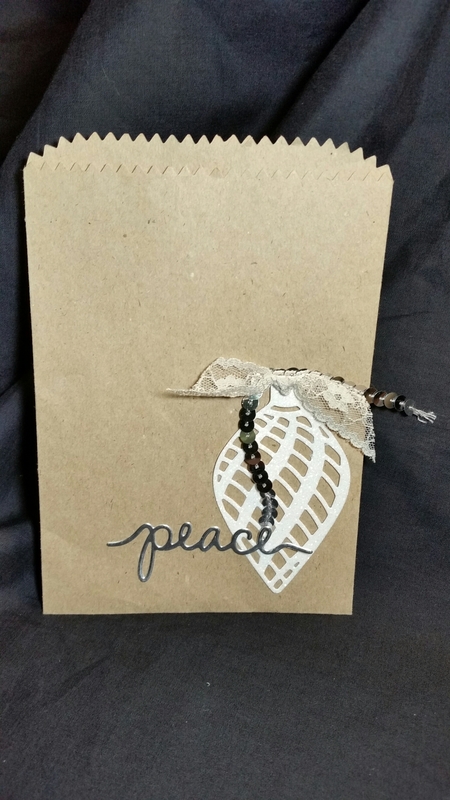 The peace is from the Christmas Greetings Thinlits, I cut it out of silver foil. LOVE the silver foil. I’m very impressed with it because it’s more of a card stock and not paper. So, it is sturdier than I expected it to be. This is the same concept but applied to the Pillow Box. I love this little thinlit. 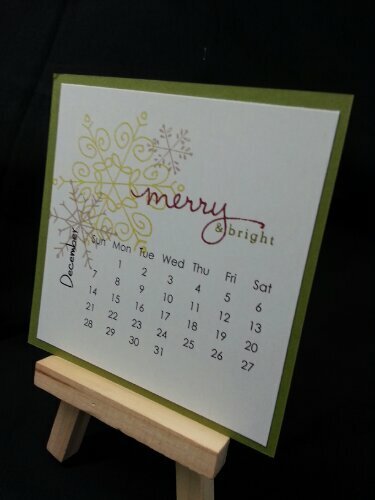 It is PERFECT for little treats or a gift card. A Christmas Crafting MUST-HAVE. You can choose to make it with or without the window. (I should have treats inside, but didn’t have anything at the time of the photograph…need to go shopping). 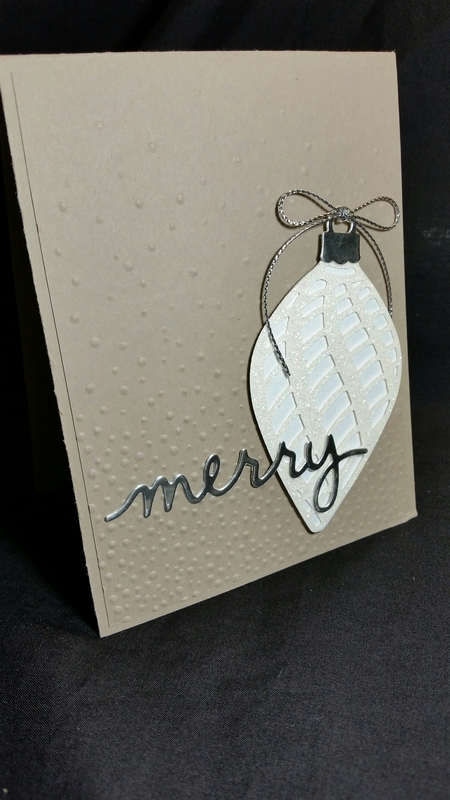 I textured the front with the ‘Softly Falling’ Textured Impressions Embossing Folder…. And here is a card with the same design… I did this to show how you can use one simple design and make it work for a variety of options. 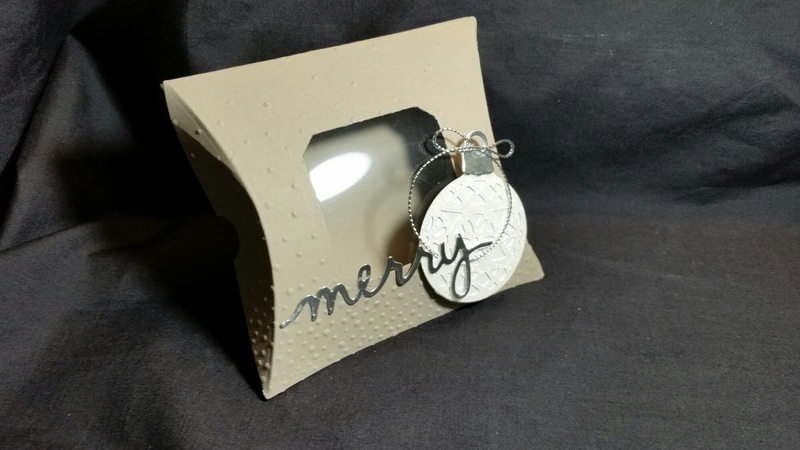 The card stock I used on the card and the pillow box is the Tip Top Taupe. 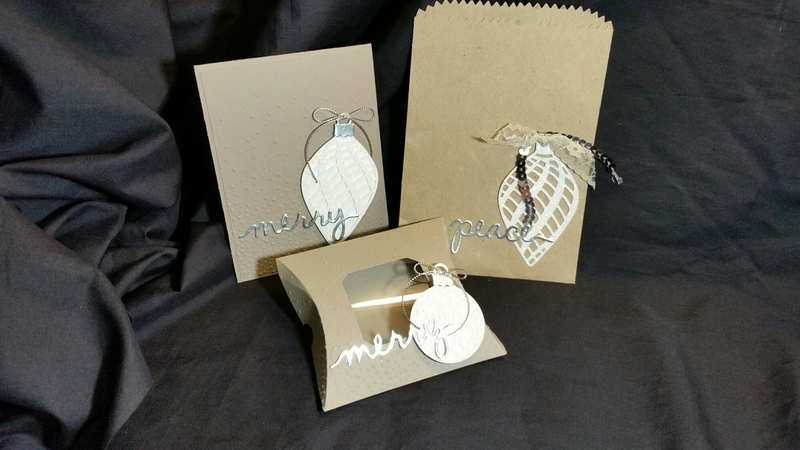 The bow on the card and pillow box is the new silver twine. We’ve been waiting for this twine. The card picture is the best one to see the Dazzling Details Glimmer Paper, but it still isn’t that great… you will have to trust me on this… it is amazing. Anyway, hope this inspires you as you start on your Christmas crafting! !